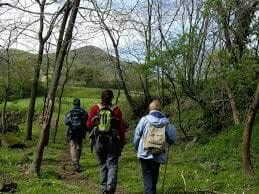 Itineraries of the Natural Park of the Volcanic Zone of La Garrotxa. Routes to the Area of Natural Interest of La Garrotxa (Sadernes, Oix, Beget, Santuari de la Mare de Déu del Mont). Itinerannia: It is a network of trails of 2,500 km between the districts of Ripollès, Garrotxa and Alt Empordà, recovering roads that had been used in antiquity.